Place emails into a quarantine - Route emails that match phishing and malware controls to a new or existing quarantine. This will be available for new and existing controls. Protect against anomalous attachment types in emails - Identify emails with unusual attachment types and choose to automatically display a warning banner, send them to spam, or quarantine the messages. Protect your Google Groups from inbound emails spoofing your domain - Identify unauthenticated emails potentially spoofing your domain and choose to automatically display a warning banner, send them to spam, or quarantine the messages. In addition to the new controls, we’ll also update the interface to make it easier to see what settings you have applied and understand what actions you’re taking as a result of each control. By adding more specific controls, including the ability to quarantine potentially risky messages, we hope to enable admins to optimize protections for their organization. This will help reduce threats and increase the security of your data while making the experience as simple as possible for your users. Admins: Find and turn on the beta features at Admin console > Menu > Apps > G Suite > Gmail > Safety. You’ll find new options to turn on anomalous attachment and groups spoofing protections, and see the quarantine option available for all controls. Use our Help Center to learn more about how to enhance phishing and malware protection. 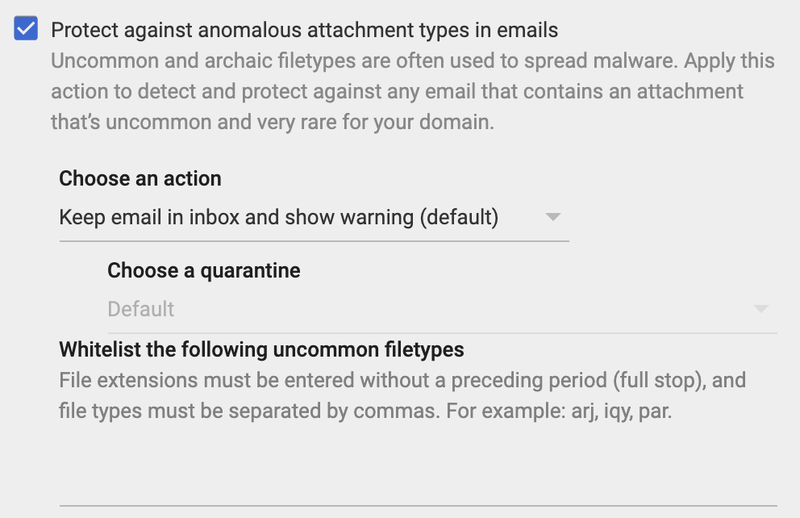 All the advanced safety settings for Gmail now let you quarantine emails more easily. Choose to move any email that meets certain criteria to a pre-existing quarantine, or create a new quarantine for such messages. Use our Help Center to find out more about email quarantines. Less common file types as email attachments are often used to spread malware. However, different domains might have legitimate uses for uncommon file types. Therefore we’re giving admins more control over how to handle emails with these files attached. What is identified as an anomalous attachment will be automatically customized for each domain. An intelligent algorithm determines which file types your domain commonly receives and will model the detection based on that. For example, a specific file type may be commonly used on Domain A, but not on Domain B. If both domains had the "Anomalous Attachment" setting enabled, an email with this file type attached would be flagged for Domain B, but not Domain A. You can see which file types are filtered for your domain by going to the security center’s suspicious attachments chart, filtering by "Anomalous Attachments" and then looking at "Attachment Extensions" (available to G Suite Enterprise and Enterprise for Education domains only). Turn the uncommon attachment type detection on or off. If turned on, choose whether to keep relevant emails in the user’s inbox with a warning banner displayed, send emails to spam automatically, or move emails to quarantine. While we expect the anomalous attachment customization described above to work well, if needed admins can whitelist specific uncommon file types they don’t want identified. Turn the Groups spoofing protection on or off. 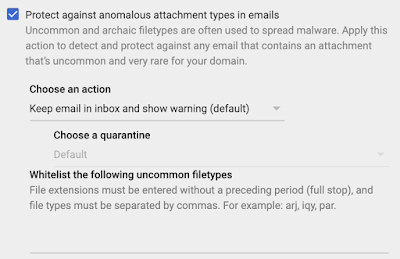 If turned on, choose whether to keep relevant emails in the user’s inbox with a warning banner displayed, send emails to spam automatically, or move emails to quarantine (if available). Controls are available to all G Suite editions. Chart to view affected emails available is part of the security center and so is available to G Suite Enterprise edition only. This feature will be OFF by default.